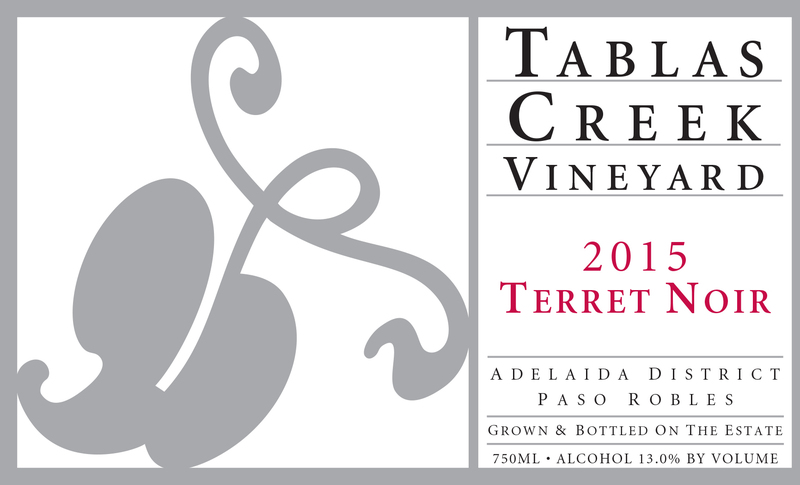 The Tablas Creek Vineyard 2015 Terret Noir is the third varietal bottling of this unique estate-grown varietal, propagated from budwood cuttings from the Château de Beaucastel estate. The 2015 Terret Noir is a pale garnet color, with a spicy, lifted nose of dried herbs and wild strawberries. On the palate it shows a persistence surprising for such a pale red wine, with crunchy red fruit like pomegranates and red currants, complex notes of black tea and dried roses, good acids, and some grippy tannins on the finish. We have no idea how it will age, but think it's lovely lightly chilled with a charcuterie plate right now. Terret Noir is a little-known blending grape from the south of France; in addition to being one of the permitted grapes in Chateauneuf du Pape, it was once (before 1850) the most planted variety in the departement of Herault. The half-acre that we planted here in Paso Robles is California's first. Terret Noir is a large-berried grape that produces wines with pale color, good acidity, and a spicy, floral, earthy wildness. While we expect to ultimately use it in our red blends, with these early vintages, we are exploring what our 1904-edition French ampelography calls its "qualities of lightness, freshness, and bouquet". The 2015 vintage saw dramatically reduced yields from the combined effects of four years of drought and cool, unsettled weather during May's flowering. Months alternated between significantly cooler than normal and significantly warmer than normal, which produced an early start to harvest but required multiple passes through most vineyard blocks during a long, drawn-out picking season. Yields were down as much as 50% in early-ripening grapes like Viognier and Syrah, but later grapes like Mourvedre and Roussanne were only down slightly. The result was a vintage with excellent concentration but unusually good acids, and wines with dramatic perfume, texture, and intensity. Our Terret Noir was harvested on October 8th. The Terret Noir grapes were grown on our certified organic estate vineyard. The fruit was destemmed and fermented on the skins for two weeks in a 1-ton microfermenter, punched down twice daily, to extract maximum flavor from this thin-skinned grape. Only native yeasts we used. After three weeks, the berries were pressed and this was combined with the free run juice into two 60-gallon stainless steel barrels. It aged there until we bottled it -- early, to capture maximum freshness -- in April of 2017.